To build a truly great social sector organization, you need more strategic rigor than the average business corporation. This is unobvious to most people, says Bill Meehan, because nonprofits generally operate at a much smaller scale than enterprises that show up in the Fortune 500; but when you adjust for scale, a social sector organization is more complex, the problems more intractable, and the economic engine more uncertain than what companies face in rational economic markets. Simply put, it is substantially more difficult to build a great social sector organization than to build a great business corporation of similar scale. And that is why the best-run, most-impactful nonprofits stand as some of the most impressive enterprises in the world. “The best nonprofits are truly spectacular,” said Kim Jonker in a conversation about this book. “They will take your breath away.” And yet most nonprofits limp along, operating far below their potential impact. So, what does it take to become a truly great nonprofit, one that can scale its impact? Certainly, we need Level 5 leaders—those who lead with a blend of personal humility and indomitable will in pursuit of a noble purpose. We need the right people on the bus, and in the key seats. We need to build a culture of discipline: disciplined people who engage in disciplined thought and who take disciplined action. And we need to construct a self-reinforcing flywheel that builds momentum: attract believers, build strength and capability, demonstrate results and impact, build a brand reputation, and then repeat the cycle, over and over again. But even with all that, we need to know what to focus on, the few levers that most matter. That is precisely what Meehan and Jonker have distilled into these pages. Most nonprofit leaders are well intentioned and full of passion, but many lack a road map for how to harness their prodigious energies and limited resources to maximum effect. They jump in the car and just start driving with an idea of their intended destination; they’ll get somewhere, but without a map, they are unlikely to end up someplace great. 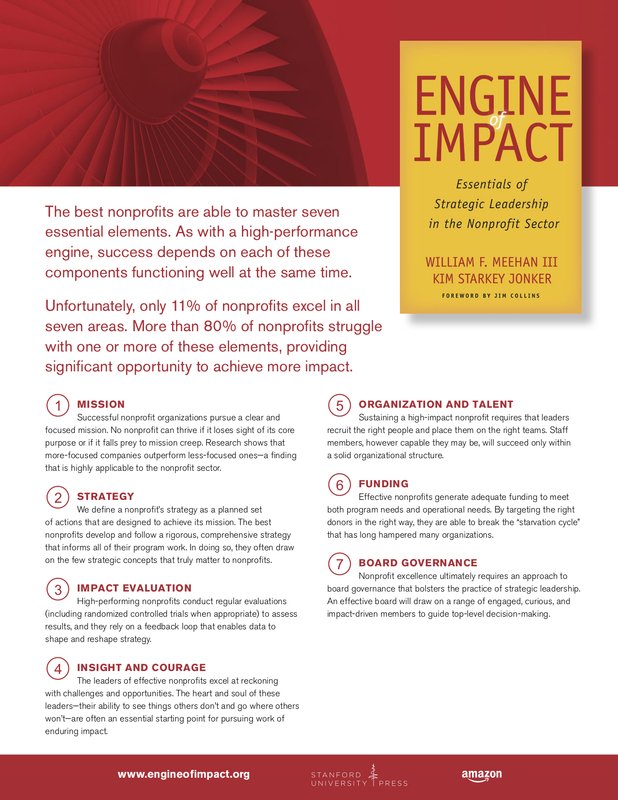 This book is, in essence, a detailed road map of disciplined thought and action for turning a good nonprofit into one that can achieve great impact at scale. Imagine you seek to accomplish multiple gold medals in your chosen sport. What would it take? Within the small set of the most critical dimensions, you cannot have a weakness. If, as a middle-distance runner, you have awesome leg speed yet lack smart racing strategy, you will likely find yourself in poor position at the end of the race. If, as a gymnast, you have exquisite precision to hold balance on the beam yet lack the explosive power for a soaring vault or tumbling run, you will fail to win the all-around medal. If you do well in the water but fade in the run, you cannot win the triathlon. If you are physically gifted yet tend to collapse mentally under pressure, you will likely excel at lower levels of competition, but your weaknesses will show in the biggest events. Your mission must be clear and focused. You must develop a strategy rooted in the few strategic concepts that matter most. You must figure out how to count what counts to ensure impact. You must have insight and courage, bringing heart and soul to making and executing on hard decisions. You must build a superb organization, a team of teams, that exemplifies the principles of high-performing organizations. You must attend to money, as cash flow is like oxygen to breathe, by crafting a strategic revenue machine that includes the right donors. You must achieve exceptional governance, building and nurturing a strong board that works. 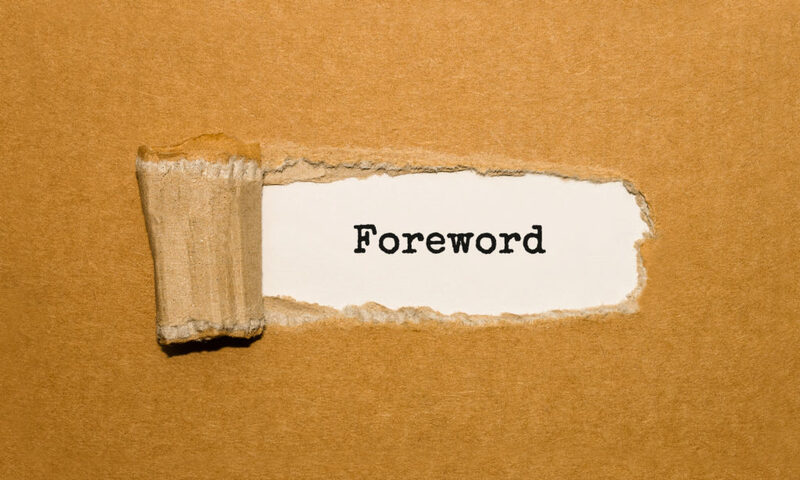 The real key to getting the most out of this book lies in having the right mind-set and obsessive dedication—to set forth with the intention to not simply “get in shape” but to set out to win the world championship, to earn the gold medal of nonprofit impact. So, as you head into the text that follows, you might want to consider the following questions: Are you willing to demand nonprofit performance, not just good intentions? Are you willing to make rigorous fact-based decisions, even if those decisions run contrary to popular opinion or self-interested large donors? Are you willing to favor impact over recognition? Are you willing to scale proven innovations for widespread impact rather than just seeking to innovate on a small scale? Are you willing to bring your best, most intense, most creative, most disciplined self to your nonprofit work? As Meehan and Jonker teach, the creativity and discipline required to build a great nonprofit substantially exceeds the creativity and discipline required to build a great business corporation. If you do your work well, the best business corporations should come to see your nonprofit as an exemplar of excellence from which they can learn. But even more important, you can change the lives—maybe even save the lives—of the people you serve. They are depending on you to get it right.